1) With prisms and objectives locked in place, it’s highly unlikely that alignment could change during shipping or transport. 2) Parallelism will not change when rotating eccentric objective cells- in other words, any adjustment made will not cause “conditional alignment”. 3) The rotation of objective cells is very easy to do, and only requires an optical spanner wrench with a diameter that matches or exceeds your binocular’s objective diameter. Your XL Series binocular was collimated at Oberwerk prior to shipping to you. It’s unlikely to ever need adjustment, but should you want to do so, the process is very simple. You should also be aware of possible eyepiece eccentricity- where images can move with the rotation of the eyepiece in the focuser. So before making any adjustments, be certain any misalignment detected is not being caused by the position of the eyepieces. To start, make sure the binocular is level, facing a very distant target that can be used to determine alignment. Using an optical spanner wrench, remove the lock-ring from both objectives. 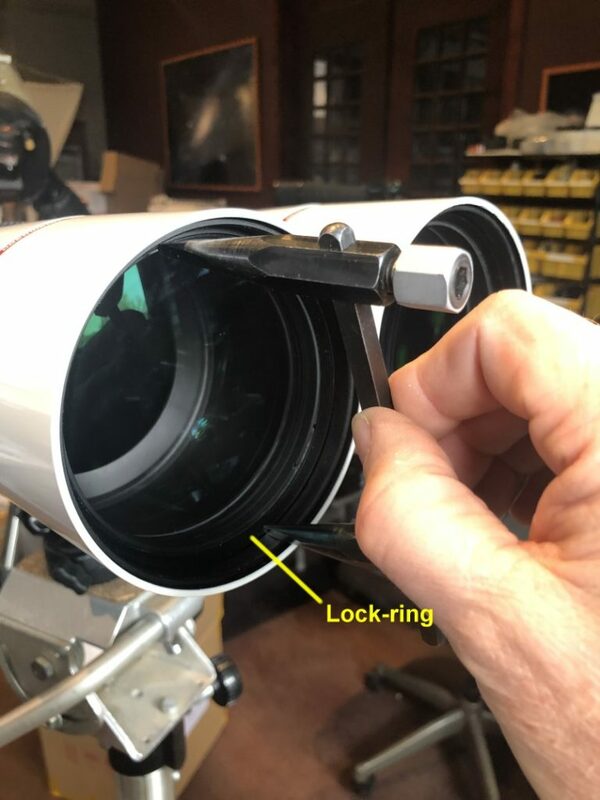 Be careful that the spanner wrench does not slip from the notches in the lock-ring as they could scratch the lens surface. Note that with the lock-ring removed, the objective cell can be removed from the objective tube (don’t do this). There are rubber O-rings that seal between the cell and the tube that will also hold the cell in place, but don’t rely on the O-rings to prevent the cell from falling out- so be sure that the binocular does not tilt downward at the objective end. Determine which way the images need to move, then use the spanner wrench to rotate one cell or the other in small increments, to see which cell and which direction improves or worsens any misalignment. It may require rotation from just one cell, or both, to produce the desired correction. Another good thing about this alignment process is the adjustment range is limited, so it’s impossible to really mess things up, no matter what you do. Once alignment is as perfect as possible, simply reinstall the lock-rings and tighten firmly- but not too tight as we only want to prevent inadvertent cell rotation. If you have any questions, please contact Oberwerk technical support by phone or email at [email protected].